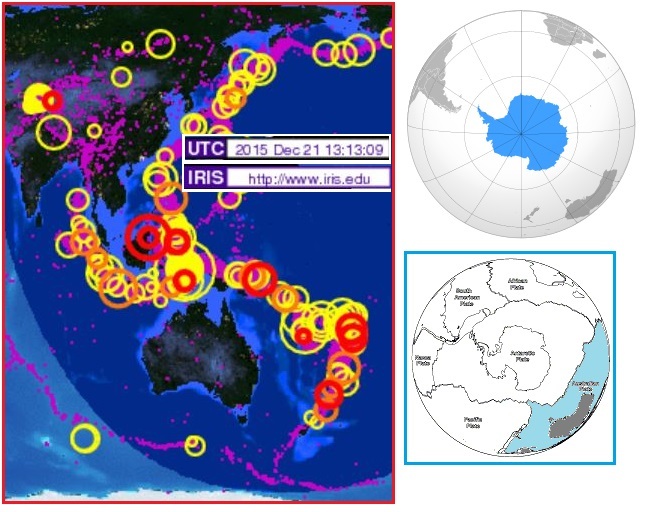 What do quakes outlining the Antarctic Plate say about the status of the 7 of 10 plate movements? The sequence of events during the 7 of 10 movements began when the Indo-Australian Plate tilted its eastern edge up, while plunging India under the Himalayas. The opening in the south Pacific then allowed S America to roll, falling to the west over the Nazca Plate. As the southern Atlantic rips open, the African Plate begins its roll eastward. All of this is in process. ZetaTalk Prediction 10/16/2010: The sequence of events is, thus: a tipping Indo-Australia Plate with Indonesia sinking, a folding Pacific allowing S America to roll, a tearing of the south Atlantic Rift allowing Africa to roll and the floor of the Mediterranean to drop. 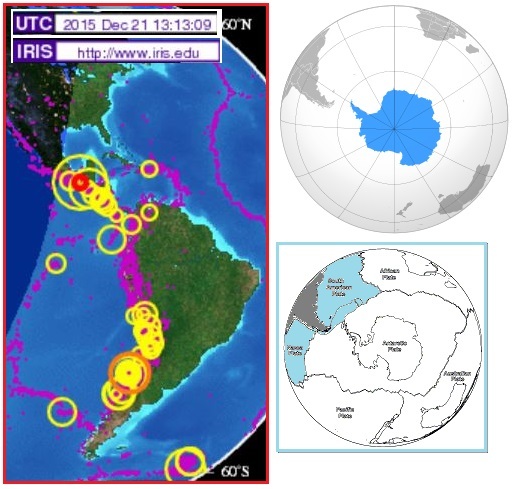 Note that the Antarctic Plate is now outlined in quakes, on all sides. Below the highly active Indo-Australian Plate, where quakes outline the entire eastern portion of the plate along the border with Sumatra and Java and around through the Solomon Islands and down along New Zealand. Here the Antarctic Plate is breaking free from its attachment to the Indo-Australian Plate, which is lifting and tilting. Then quakes appear along the Nazca Plate and S American Plate. Here the Antarctic Plate is being forced eastward as the Pacific compresses. As it moves eastward, it is beginning to rise up, as it is being squeezed in the Pacific by the compression, and pops up between the tip of S America and the tip of Africa, eventually forming new land there. ZetaTalk Prediction 2/15/1999: The Antarctic plate finds the side abutting the Pacific under pressure, as the plates due to fold or crumble or subduct in the Pacific begin to do this. This in effect is forcing the Antarctic plate to fold itself, like a fan, and it resists this pressure to fold. The tendency is rather for the Antarctic plate to break away from these bordering plates, so it then becomes free to move. Likewise, along the Atlantic, the spreading plates in the Atlantic are asking the Antarctic plate to rip apart, which it resists, being a very solid plate. The point that gives, the weak point, is the border between the Antarctic plate and those in the Atlantic, as these are already weakened points. Thus, these weak points separate, the Atlantic plates going their way, the Antarctic staying in place. The Antarctic plate is now free on all sides! The overlapping and compressing plates on the Pacific side represent pressure and push. The separating and spreading plates on the Atlantic side represent an opening, so the Antarctic plate moves in that direction. Freed of tight borders, it is free to float or sink in the sea of lava that all plates ride upon, and as a land plate, being lighter than those that have sunk under the deep seas, it floats - new land! 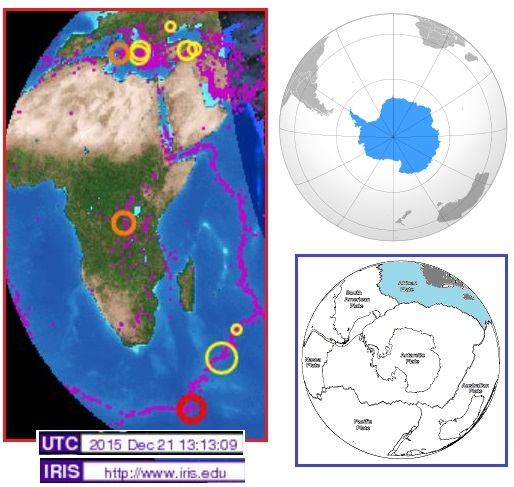 As the south Atlantic rips apart during the S American roll, the African Plate is free to roll to the east, and this is shown as quakes along the Antarctic Plate also. Elon Musk made Space X history on December 21, 2015 by relanding his booster rockets after launch. With one exception, this is a success for him. He did not succeed on landing on an ocean platform, as had been his prior press. Musk’s last attempt last June 28, 2015 was a spectacular failure when their rocket exploded on launch. Then there was the earlier failure in April 15, 2015 when the attempt to land the Falcon onto an ocean platform for reuse dramatically failed. Per the Zetas, these failures were firm messages from the Council of Worlds that the elite should not plan on getting to Mars to escape the Pole Shift on Earth. Launching satellites was OK. Resupply of the ISS was OK. 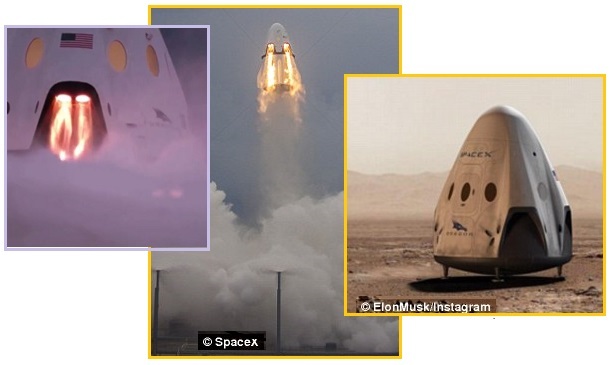 Escape to Mars and apparently even landing on a floating ocean platform was not OK.
ZetaTalk Insight 7/4/2015: What is the message here? As with other failed launches, this most recent failure is a definitive message from the Council of Worlds. Space X has had success in resupplying the ISS, though has flounded on landing on a floating ocean platform. Resupply of the ISS is OK, reuse of their launch equipment so as to help the elite escape, not OK. The message now is that the elite should not expect to get into space at all. No escape. The message here is to take all hope away from such plans among the elite. They are to remain on Earth with the common man. Once again Elon Musk set out to launch his Space X Falcon, this time skipping the ocean platform landing and instead returning to land. Was the ocean platform somehow the problem? After a lengthy hiatus from spaceflight, SpaceX will launch its next Falcon 9 rocket again on December 19th. The rocket will carry 11 satellites for the New Jersey-based telecommunications company Orbcomm into lower Earth orbit. 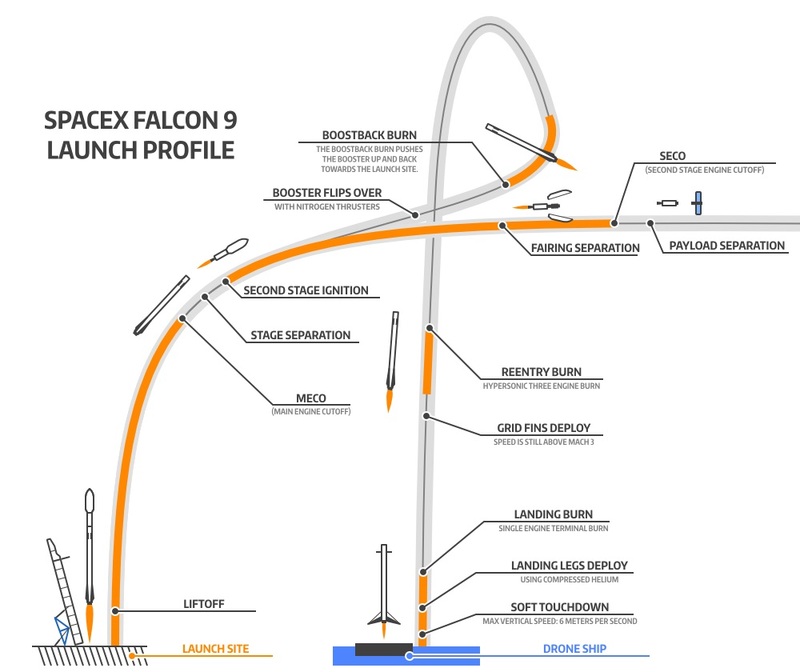 It will be the first time the Falcon has flown in the past six months. SpaceX's rockets have been grounded since June, after one of its Falcon 9 rockets exploded while carrying supplies to the International Space Station. The upcoming launch will test out a new version of the Falcon 9 that will make it easier for the company to recover the rocket after take-off. For the past year, SpaceX has been trying to gently land its Falcon 9 rocket on a platform at sea post-launch. This time around, SpaceX will try another type of first, too. It will attempt to land the rocket back on solid ground at Cape Canaveral, Florida rather than its autonomous drone ship in the ocean. The underlying message was not lost on the media. This is for the elite, plain and simple, to escape future horrors on Earth. 'Star Wars’ Class Wars: Is Mars the Escape Hatch for the 1 Percent? It’s nice to know Elon Musk and Jeff Bezos have a plan. They will help the richest people in the world go to Mars and start over, leaving the other 99 percent to suffer on a dying, warring planet. This is the unspoken flip side of Musk’s SpaceX and Bezos’s Blue Origin. The space travel companies say they are creating a way for the human species to endure by populating other planets. But the bottom line is that only the wealthy will have the means to move to Mars. Musk’s target ticket price is $500,000 a person in 2015 dollars, and that’s just to get there. Mankind may only have a brief window to set foot on Mars before a disaster such as a third World War makes it no longer possible, Elon Musk has warned. In particular, he believes a Martian colony could help to ensure humanity survives if there is ever a calamity on Earth that destroys life here. 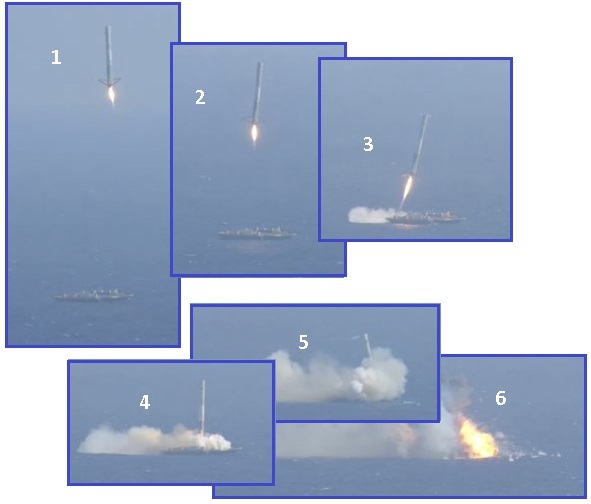 His company has also been developing reusable rockets that can land on barges at sea, but in June suffered a setback when its Falcon 9 rocket broke apart shortly after liftoff. It has also been developing a version of its Dragon cargo spacecraft that will be capable of carrying crew. But Musk said he was preparing to announce detailed plans of a mission to colonise Mars early next year, known as the Mars Colonisation Transport programme. Earlier this year NASA employees revealed a 'budget' plan to send a SpaceX capsule to the red planet in 2020 to return samples left by the next Mars rover. The Council of Worlds began warning Elon on August 24, 2014 when a Falcon rocket blew up, and the ZetaTalk was clear. You will not go to Mars. 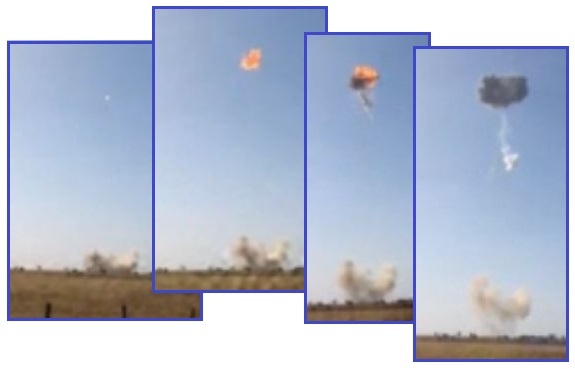 Debris from the unmanned SpaceX Falcon 9 Reusable (F9R) rocket, which self-destructed less than 20 seconds after launch, rained down from the flames onto an open field outside of McGregor. A rung on the long ladder to Mars broke Friday, when a rocket test in Texas ended in a midair ball of fire. It's not how it flies up but how it comes down that makes the F9R a steppingstone to a Mars mission. The rocket has a landing gear -- four legs that stick out like an insect's. So did its even shorter predecessor, which bore the name Grasshopper. ZetaTalk Message 8/30/2014: The elite are intent on an escape to Mars but have repeatedly been told via ZetaTalk, as they were most recently in 2013 re a SpaceX endeavor, that this goes against an existing Council of Worlds edict. That their 2014 launch of a Falcon 9 Reusable rocket failed to launch should thus be no surprise. The elite must remain with the common man they so despise during the coming Pole Shift. NASA is obviously in bed with Musk on his plans for a manned mission to Mars, including him in a recent recruitment ad for more astronauts. The media was quick to associate NASA with Elon Musk. Contenders need to be U.S. citizens with a bachelor's degree in science, math or engineering. Expect intense competition: More than 6,000 applied for NASA's last astronaut class in 2013, with only eight picked. It's an elite club, numbering only in the 300s since the original Mercury 7 chosen in 1959. 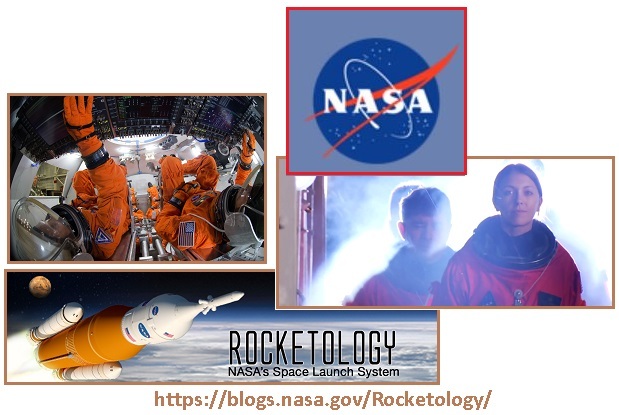 Future astronauts will have four spacecraft at their disposal: the International Space Station, two commercial crew capsules to get there, and NASA's Orion spacecraft for eventual Mars trips. Easily SpaceX's biggest project and the one getting the most attention from the public is SpaceX's part in NASA's Commercial Crew program. In November, NASA officially made its first order from SpaceX to send astronauts to the International Space Station. Another recent win for SpaceX was getting the contract to carry satellites for the Pentagon. Musk has talked about building a network of mini-satellites that would beam down Internet access for a while. So Elon Musk bravely set out once again to launch and land a Space X Falcon, this time skipping the attempt to land on an ocean platform. Why landing on an ocean platform in the first place was ever considered was a puzzle, as this was apparently only to save fuel. Bringing the stage one rocket back to land for re-use takes 15% more fuel than to simply land where the rocket re-enters out over the water. None of this quite makes sense, cost benefit wise, as the ocean platform is a huge expense, so another agenda seems at play. Avoiding populated areas was another stated consideration. But the December 21, 2015 launch and return to land was a success, negating the populated areas excuse. Why did SpaceX Attempt to Land the Booster on a Barge Instead of Somewhere on Land? I understand the benefits of reusability for the rocket booster. But I don't understand why they're landing it on a barge. I've read tons of articles about this but not one has even hinted at an answer. Why is landing on a barge preferable over a launchpad or any other large flat surface that isn't moving with the waves? … Musk says the payload hit for RTLS (Return To Launch Site) is 30% vs a 15% payload hit for landing on a downrange ocean platform. … I see nobody seems to have mentioned the simplest reason why they're not landing on land: there isn't any. They launch east from Florida, and there aren't any islands in the Atlantic out there. The landing experiment would have involved bringing the first stage of the two-stage rocket down onto a floating platform in the Atlantic Ocean, about 200 miles off the coast of Florida. Such a feat has never been done before. The ocean platform landing was avoided on December 21, 2015. Why? The Zetas explain. 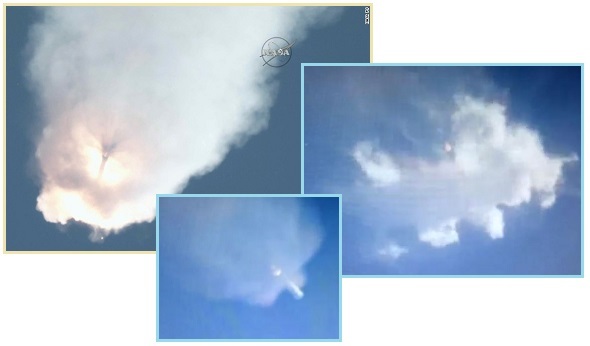 The launch and landing in Cape Canaveral, Florida, were the first from the private U.S. spaceflight company since its rocket exploded on liftoff in June. 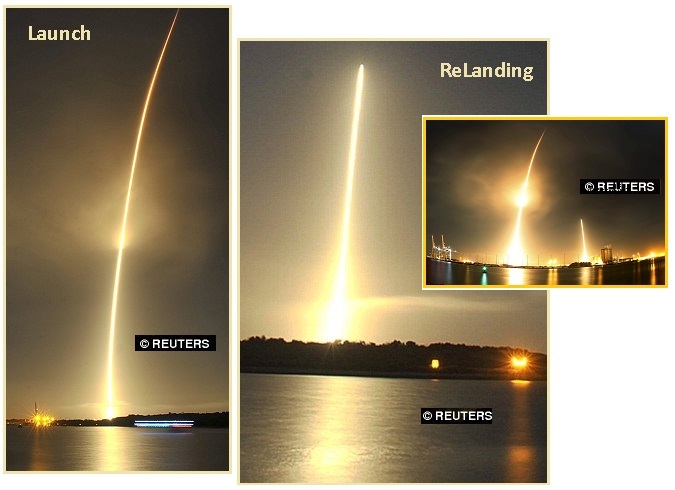 SpaceX had not previously attempted to land a rocket on land, and it marked the firm's first successful attempt to recover a rocket from an orbital flight. Previous attempts, all unsuccessful, were attempted on floating landing pads. The 15-story first stage of rocket — used to propel the payload to 62 miles or so until the second stage takes over — successfully landed on Earth again at a prepared landing zone. SpaceX has made history after successfully launching its Falcon 9 rocket into space and returning it to Earth in one piece. The upgraded 23-story-tall rocket lifted off from Cape Canaveral Air Force Station at 8:29pm EST, and touched down nearby a few minutes later. It was the first time an unmanned rocket returned to land vertically at Cape Canaveral, and represented a tremendous success for SpaceX. The firm, led by billionaire Elon Musk, is striving to make rockets reusable to drive launch costs down. ZetaTalk Insight 12/26/2015: After repeated failures, which we described as warnings from the Council of Worlds, the Space X Falcon has successfully made a launch while relanding the booster rockets to Earth. What is the message here, amid this celebration? The trail of tears for Elon Musk included the Falcon exploding on launch last June 28, and the landing platform disaster on April 15. We explained that the Council was sending a message that the elite would not escape to Mars. Why then was the Falcon successfully launched with the booster rockets landed back in Cape Canaveral? Noticeably lacking this time was the landing on an ocean platform. Why is this key? Landing on an ocean platform did not make sense from a cost benefit analysis. Espoused for saving a mere 15% in fuel costs, it carried the overhead of the platform itself. Musk stated the reason for an ocean landing was to avoid a crash on land, near populated areas, during initial practice runs. But without a successful landing, this December 21 landing was done directly onto land. The real goal, an ocean platform landing and launch, was dropped, so that simply launching satellites and resupplying the ISS would be involved for the present and in the future. Despite much crowing in the media about manned missions to Mars, all involved know this will never be accomplished. It is bravado and face saving. The missions to and from Mars would require operating during the Last Weeks and in the Aftertime, when Cape Canaveral in Florida will be awash and under water. Houston likewise will be quickly under water. The elite at NASA and hovering around Elon Musk are well aware of the ZetaTalk predictions and accuracy, and see how quickly Nibiru is approaching the Earth. They know that time is tight, the timeline compressing, and if a replacement for a land launch is not available, all is lost! As Nibiru draws closer, coming from the right in its retrograde orbit, and the Earth attempts to escape by moving to the side, to the left, as far as possible, the opportunity for dramatic second sunrises and sunsets increases. Compare the size of the Second Sun in 2015 to those making an appearance in 2014, 2013, 2012, 2011, 2010, and 2009. It has become huge. From Ontario, Canada in 2014. 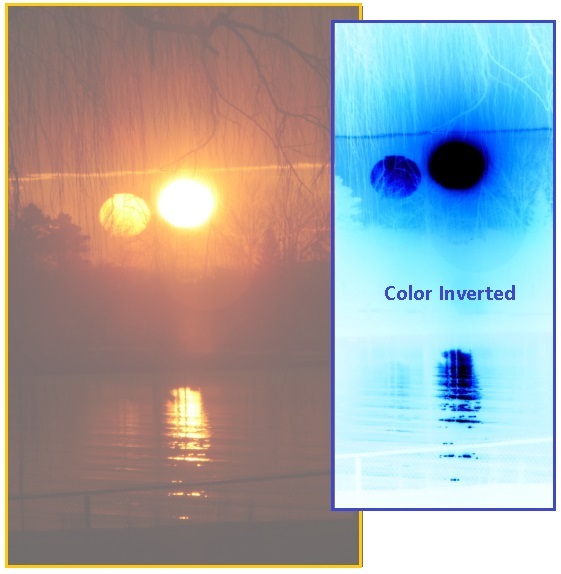 Note the Second Sun has its own reflection on the water, and is not a flare or camera ghost as it stands behind the vegetation. I awoke early to witness a sunrise that appeared like a double sun – I tilted the camera for the deep red but that sun was mesmerizing in its reflection. And from Cancun, Mexico on December 7, 2015. This Second Sun also has its own reflection on the water. And of course Alberto continues to capture dramatic photos of the Planet X, aka Nibiru complex, as the N Pole of this monster has turned toward the Earth, and is spraying its Moon Swirls and debris in this direction.